Light: Showing your emotions freely. Throwing yourself into romance. Nursing a secret crush. Indulging in romantic fantasy. Starting a new relationship. Recalling your first love. Experiencing love for the first time. Converting to a new religion. Shadow: Mistaking a crush for true love. Reading romantic intention into innocent action. Frantically trying to impress others. Indulging in overly-sweet sentimentality. Pretending to more romantic or spiritual experience than you possess. Personality: The Page of Wands can represent anyone who wants to or needs to learn (Page) more about love or spirituality (Cups). Though eager to make a good impression, The Page may lack the experience or information needed to handle new love or new faith with grace and confidence. He or she may overcompensate for this with over-the-top gestures and fanatical zeal. Story: The Main Character has a “fish out of water” experience, leaving him or her feeling uncertain and awkward. Relationships. Fools rush in. Don’t mistake the heady rush of infatuation for the enduring stability of true love. Why rush? You’ve got plenty of time to decide what works (and doesn’t work) for you. Before making commitments, learn the ropes. Work. Be indulgent of beginners and channel their enthusiasm into useful projects. Be wary of those who overstate their skills. Keep your own skills sharp by pursuing every opportunity to be a student. Generate change by embodying enthusiasm. Spirituality. Embrace a new faith. In addition to pursuing what feels right, plumb the depths. Invest time pursuing the roots of your spiritual practice. Become well-grounded in what you believe, so you’ll be well-prepared to explain your practice to others. Personal Growth. A gung-ho spirit goes a long way; be sure to pair it with due diligence. Pair your enthusiasm with practical preparation, and you’ll find yourself maturing at a surprising rate. Fortune Telling. This card represents a young man or woman with a watery, dreamy demeanor, likely born a Libra, Scorpio, or Sagittarius, who wants to start a new relationship with you. When? Between September 23rd and December 21st. Awkwardness and Silliness. Most RWS-inspired cards will feature a young man in impractical attire—clothing suggesting a lack of connection with sober reality. The Page of Cups wants to play the part of the confident lover or spiritual leader, but lacks the experience required for such a role. Something Fishy. In many decks, a playful fish peeks out of the Page’s Cup. How might you recapture your own sense of wonder at the surprises served up by daily life? Making an Impression. Whatever you set out to do, some will be delighted and some will doubt you. Since you can’t please everyone, why not abandon extreme strategies and just be yourself? The Marseilles Image. 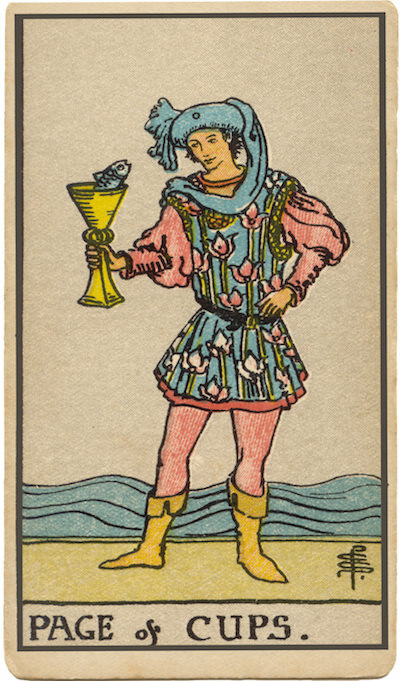 The Page of Cups walks stiffly, as though taking great care not to spill a single drop of his Cup’s contents. His eyes are fixed on the Cup, the whole Cup, and nothing but the Cup. How might narrow focus be setting you up for a fall? How worried are you that others will see you as foolish or inexperienced? To what extent can you be honest about your lack of experience in love and faith? How can you maintain enthusiasm over time?